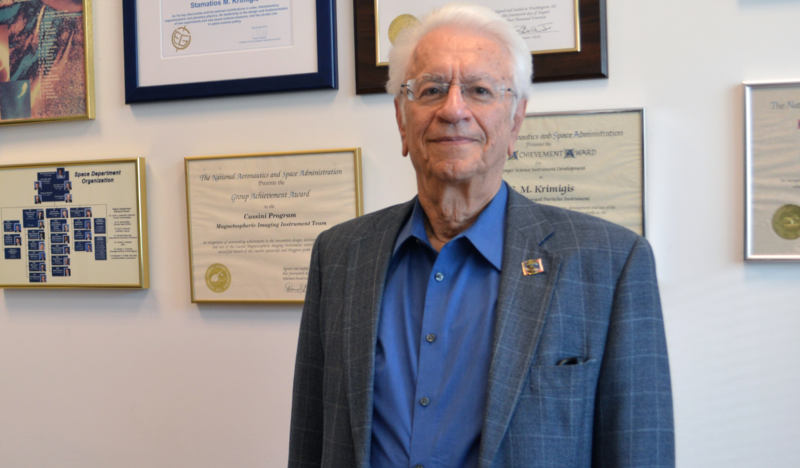 Through ingenuity, hard work, dedication, and scientific integrity, Prof. Stamatios Krimigis, born on the village of Vrontados, Chios, became one of the most influential scientists in the modern space explorations of the USA and the whole world. The man, who gave many of NASA’s missions their finest hour, is today Head Emeritus of the Space Department Applied Physics at Johns Hopkins University, Laurel, Maryland, USA and member of the Academy of Athens, Greece, where he holds the Chair of Science of Space. “The beauty of all space missions is that the most important findings end up being the ones that you don’t expect!” says Prof Krimigis among other things in an interesting conversation with Amalia Drosou. Mars was once warm and wet, but has had its atmosphere stripped away by solar winds over billions of years. It could have been frozen out. How could it preserve the water on its surface for such a long time? There is no doubt that there is liquid water on the surface of Mars, and I’m happy that the instrument that confirmed it (a hyperspectral imager) was built at my laboratory, the Johns Hopkins Applied Physics Lab. The purpose of this imager was to map the entire surface of Mars and look at its mineralogy. My colleagues found a lot of deposits of salts such as Perchlorate of Sodium and Perchlorate of Magnesium. When you mix these salts with water the freezing temperature decreases so you can be 50 degrees below zero and yet the water is still liquid on the surface. It comes from underground reservoirs that have a lot of water. Therefore one can speculate that there could be biological activity in underground reservoirs on Mars, but we don’t know anything about that. The next mission to the Red Planet (ExoMars Rover) is going to be in 2018. How are all these signs of microbiological life going to be further investigated? One of the things is to drill about two meters or so, deep into the soil and bring up some material that will be analyzed and evaluated by on board instruments. However, the sensitivity of what instruments one can place on a spacecraft is fairly limited. One would be fortunate or lucky if one can make some preliminary determination of current or past biological activity. But ultimately what has to happen is that we have to bring samples of subsoil back to earth so that it can be analyzed in earth-based laboratories with instruments that have much higher sensitivity and then be able to say definitely whether at least on those locations there was or was not biological activity. On July 2018, Solar Probe Plus (SPP) will be launched to explore the Sun’s outer atmosphere. What are your expectations about this mission? We observe the Sun remotely with telescopes, with admittedly very sensitive instruments but still it is very difficult to connect the remote observations with the actual physics that are taking place in the atmosphere of the Sun. So we are going to go within 6 million kilometers of the surface of the Sun with the Solar Probe Plus. Sensitive instruments are going to make measurements locally while at the same time we are observing it with instruments remotely from earth. This way we can connect the local measurements with what we observe and then interpret what we have been seeing on the sun in over the past 100 years. So, what do we expect you find? I wish I knew! The beauty of all of these missions is that the most important findings end up being the ones that you don’t expect, as was demonstrated recently with New Horizons at Pluto. You have travelled to all of the planets of our solar system. Which one impressed you the most? Jupiter, the King of our planets is really the most impressive because of the incessant activity in its atmosphere but also because of its moons: Io showed the first volcanoes outside of Earth, (we saw that with Voyager in 1979). Europa showed that it possesses a subsurface ocean and another candidate for biological activity in an ocean in the outer solar system. Ganymede in fact may well have an ocean but it also has a magnetic field, which is really amazing-a magnetic field within a magnetosphere! Which are your safety nets in order to minimize the risk of the failure in a space mission? Once the spacecraft is off of the surface of Earth you can’t go up and do repairs. So we have various ways of building-in safety -through redundancy. In just about every spacecraft we build, we have two communication systems, two orientation systems, to point the spacecraft at earth or the Sun as the case might be. All of these systems are on board and are programmed in such a way that once there is something wrong, let’s say in computer A, it immediately switches to computer B. Then a message that something happened is being sent to Earth. In severe cases where the spacecraft cannot function, it immediately shuts down most systems and starts looking for Earth. We lock on to the spacecraft, then we send commands, dump the memory and find out exactly what happened and when. The last time this happened to us was on the 4th of July from New Horizons. We agonized but within about 24 hours we diagnosed exactly what the problem was, sent a new upload of commands, got control on the spacecraft again and were back on the regular track. Dr. James Van Allen has been your mentor. In which way did he inspire you? I grew up with Van Allen as a graduate student. At that time it was only 3 years after the discovery of the Van Allen belts, which he had made with the first American Satellite. He was not only an exceptional scientist but also a very insightful person. He taught me how to do and to communicate science. Later on we went on different paths: I left Iowa and went to Johns Hopkins because I wanted to develop new technologies while he was more traditional in the way he wanted to approach things. But certainly I don’t think anybody could have had a better mentor than Van Allen. How far is Greece from the production of its own Space Technology? Greece has a lot of potential in terms of scientific and technical capability, with many people trained outside Greece that could play an important role in the European Space Program. But what it lacks is a decent management system-the management of anything from technical issues to institutions, to public affairs is really poor and I think that this is the Achilles heel of the country as a whole. Among the reasons we do not participate much in space is because we never organized a Greek Space Agency and we don’t devote resources to space research. The percentage of GDP devoted to research and innovation as a whole (not just space) 3-4 years ago was about 0,6% while the European average was 2,5%. There is a big gap there. I suspect that now in the past two years it is probably 0,1%. Unfortunately the future is not good. You have lived in your hometown Vrontados, Chios until the age of 18. What memories are imprinted in your mind from those days? My years there were difficult. It was right after the war and prosperity was not around the corner. But we had a very strong family life. My father was in the USA and could not come back during the German occupation, so I didn’t get to know him until I was 16 years old but my mother was a very strong woman. We had good teachers, who insisted on excellence. We studied hard and of course we did a lot of things that young people do. My own was, to get involved with the “rites of passage” to adulthood, which was to construct rockets that we used to shoot to the other church on Easter night. Our house was about 100 meters from Panagia Εrythiani, my Enoria, so every Easter we would get together, make these rockets and then shoot them at the other church. That was a vivid memory which of course I cherish-and the custom is going on today! The interview was first published in Science View.